Büşra Atalay, a Turkish woman who has previously been dismissed from her job over alleged Gülen links, lost her unborn child when she was detained and interrogated at an İstanbul hospital on Thursday. Atalay was detained by police at İstanbul Pendik Yüzyıl Hospital on Thursday over her alleged links to Turkey’s Gülen group, which the Turkish government accuses of masterminding a coup attempt last year. Despite her doctor’s objection, she was detained and interrogated by police for several hours during which she endured some bleeding and eventually lost her baby at her 24th week. According to several Turkish media outlets and twitter users, Atalay was pregnant with twins and she therefore gave preterm birth to the second baby. Since the coup attempt on July 15, Turkey has turned into a hub of people victimized by the purge carried out by the Turkish government. The ruling party of Turkey and President Recep Tayyip Erdoğan accused the Gülen group of masterminding the coup attempt and launched a widespread purge aimed at cleansing sympathizers of the movement from within state institutions, dehumanizing its popular figures and putting them in custody. However, the Turkish government dismissed over 138,000 people from state jobs, detained more than 110,000 and imprisonment of nearly 55,000 over alleged links to the group. 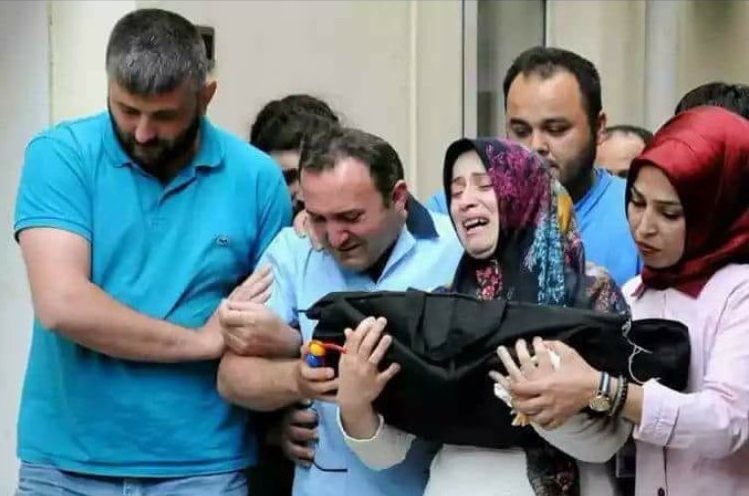 This is not the first-time Turkish police have waited outside a hospital room to detain a woman who just had a baby, as part of a government witch-hunt against Gülenists. In July, Rümeysa Doğan in an Antalya hospital and Ayşe Kaya from Edirne were detained by police after delivery. On June 2, Elif Aslaner, a religious education teacher who gave birth to a baby May 31 at a private hospital in Bursa, was detained due to alleged links to the Gülen group. In May, Aysun Aydemir, an English teacher who gave birth to a baby in an elective cesarean procedure, was detained at the hospital and subsequently arrested by a court and put in pretrial detention with a 3-day-old baby in Zonguldak province as part of the witch-hunt targeting the Gülen group. In late January, Fadime Günay, who gave birth to a baby, was detained by police at Antalya’s Alanya Başkent Hospital for alleged links to the Gülen movement. A day after Ş.A. was taken into police custody, another woman known as Meryem gave birth to twins by C-section at a hospital in Konya and was detained by police despite hospital reports said that she should not travel and was taken to Aksaray from Konya in a police car.